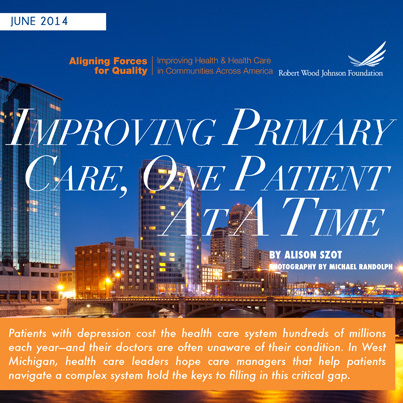 The Alliance for Health in Grand Rapids, Michigan, one of RWJF’s Aligning Forces for Quality communities, has been working to close gaps in primary care by linking up patients with depression and other related conditions with care managers. These care managers connect these patients with community services and resources, and help them navigate their journey through a complex health care system. These efforts are part of a larger primary care transformation in West Michigan, designed to improve care for this vulnerable population. See how care managers are improving primary care, one patient at a time.